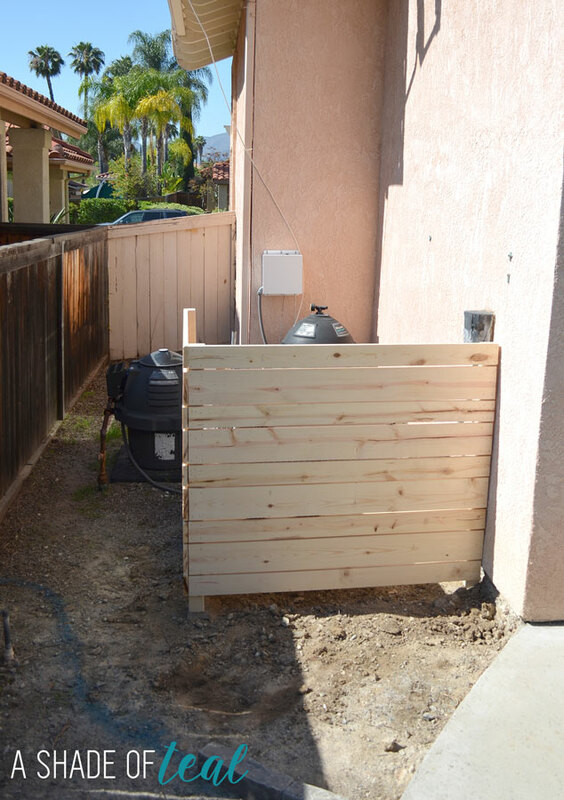 I shared a couple of weeks ago inspiration for “Drought Tolerant Landscape & Path Ideas” and “Clever Ways to Hide AC & Pool Equipment”. 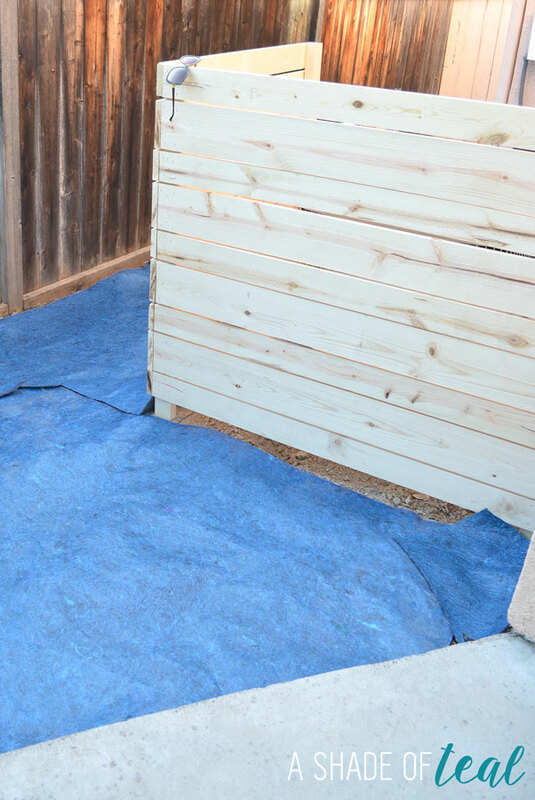 Today I’ll show you how I made this super easy Pool or A/C equipment cover. The best part, it’s removable! 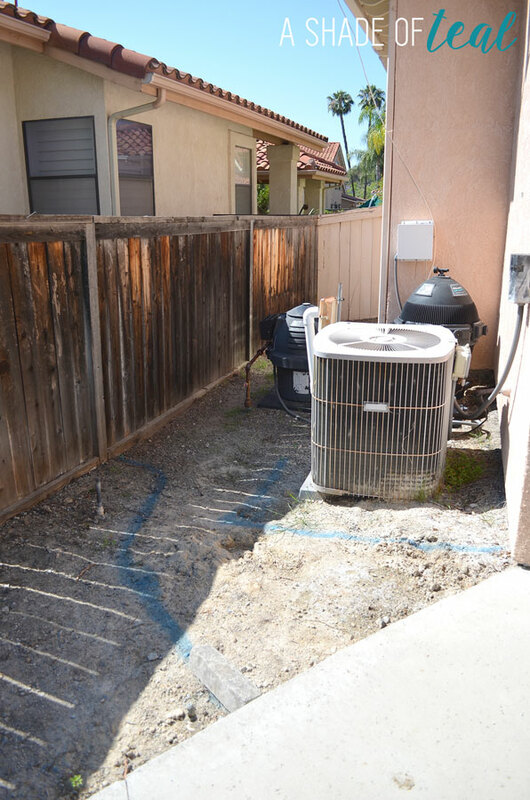 If your like me, you don’t like to see the ugliness that is a AC unit or pool equipment. This is what my beautiful side yard looked like. I should also say this is after we tore out all the old overgrown plants. Its a small section of our yard but when your in the pool you see this entire area, not pretty! I knew I wanted to add gravel/rocks for around the pool equipment but hiding the AC unit was also important. 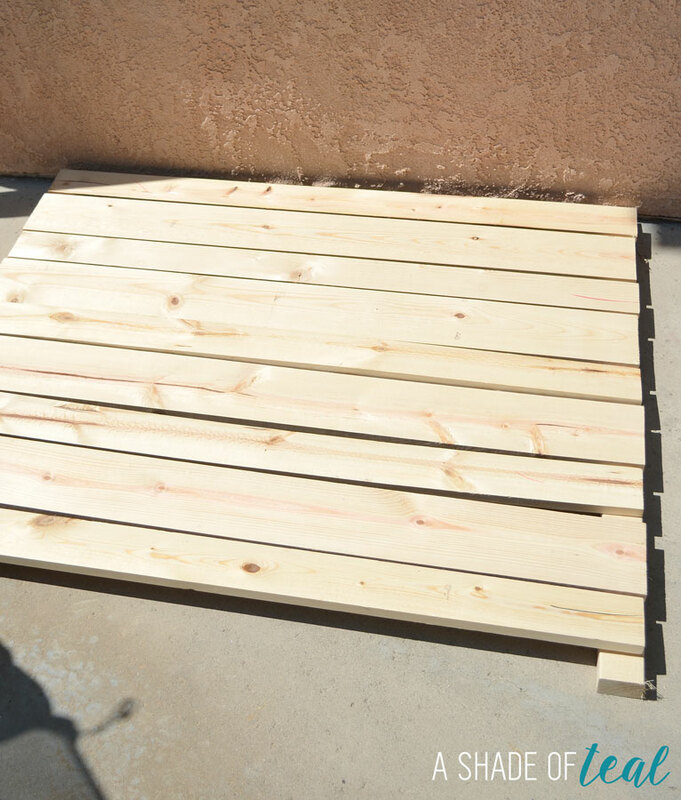 So off to the store I went and I purchased a bunch of lumber. I bought 6″ wide and 4″ wide pieces. I cut them down to size making sure the cover would have plenty of room around the AC unit. Mine was 43″ wide on the front and 50″ wide on the side. For the posts I used (3) 3″x 1″ pieces that were 50″ tall. 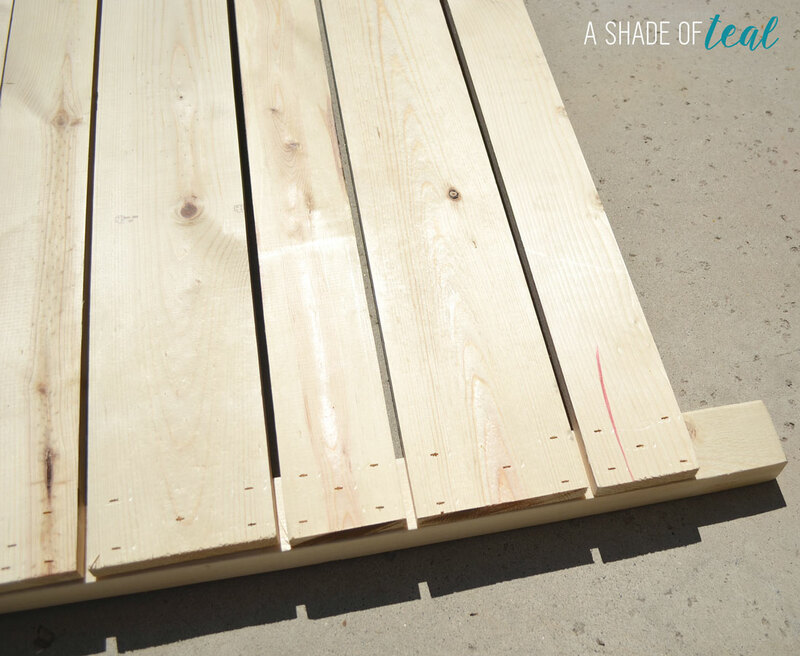 I laid 2 posts on the ground and then placed my slats over it in the pattern I wanted. You can see I left about 2″ exposed of the post. 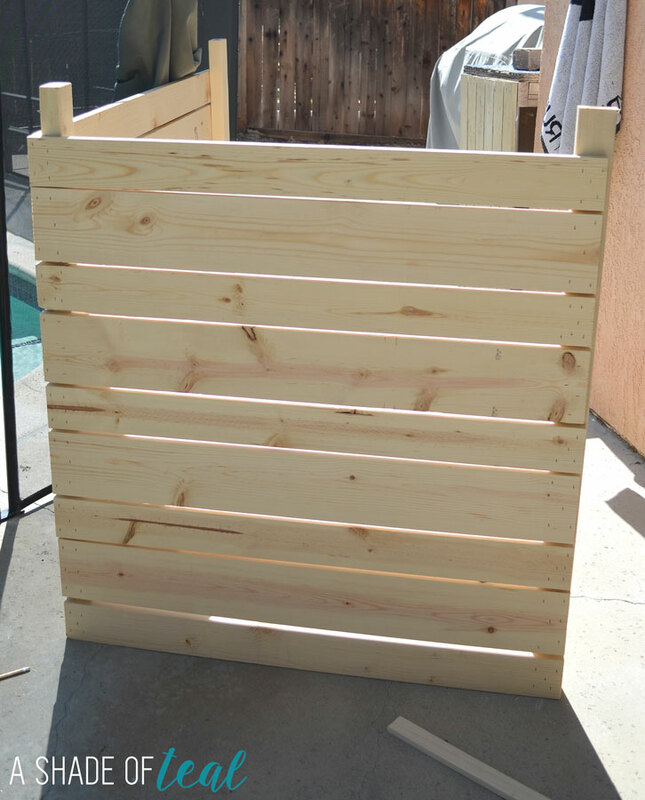 Once I figured out the pattern I got out my nail gun and started nailing the slats in place. I used a pencil to space the boards apart. I nailed both sides down before I started the next piece. Keep doing this till your 1 side is done. It turned out pretty good expect for the 3rd board from the left; it wasn’t straight so it bowed a little too much. Oh well! Now for the tricky part, you might need help. Or you can use the side of the house like I did! But stand the wall upside down. 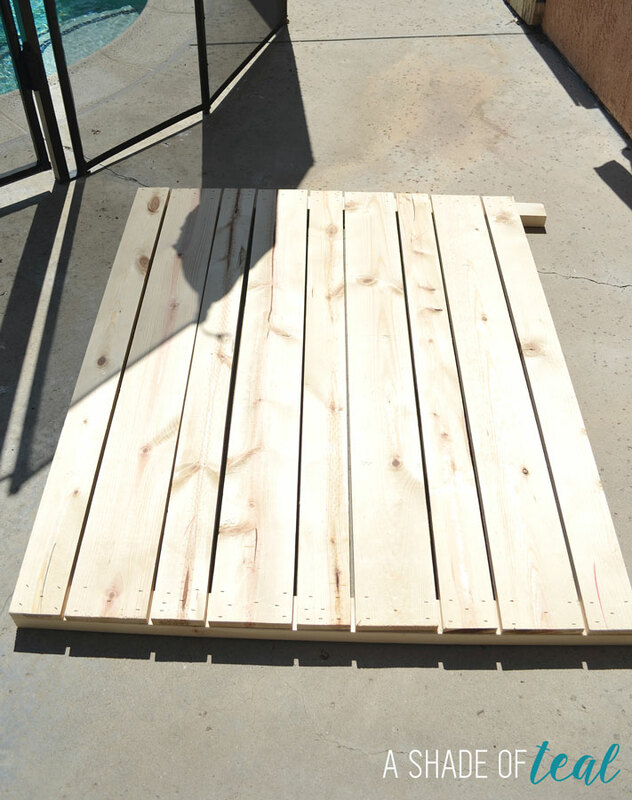 Then take your 1st slat for the side and nail it on 1 side. 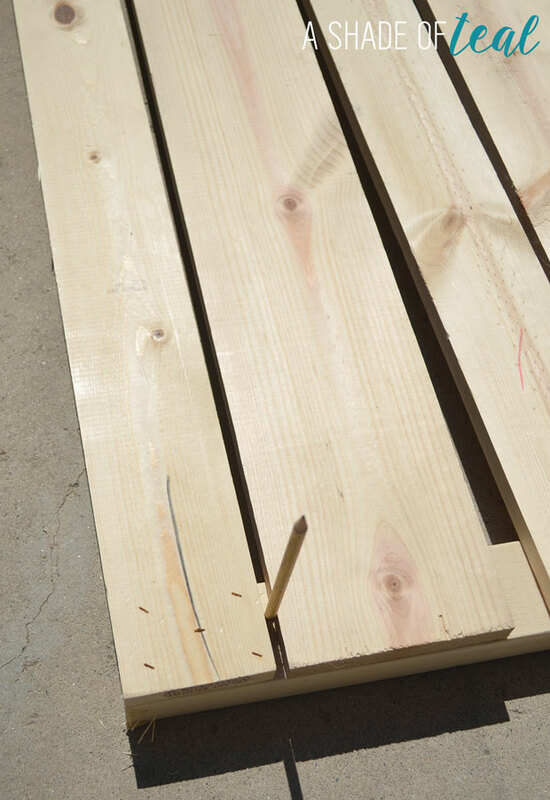 You need to also make sure you will be attaching the slat to the correct side. For my cover the side cover needed to be on the left. 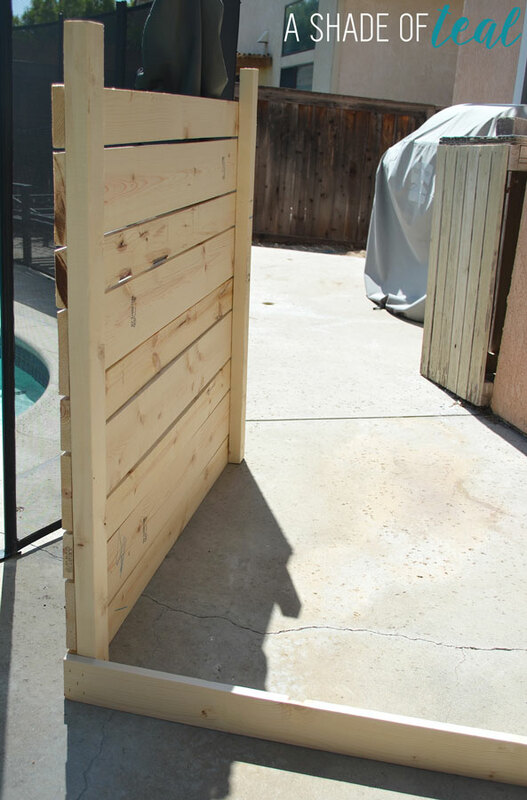 I also put the slat forward so it was flush with the front wall. 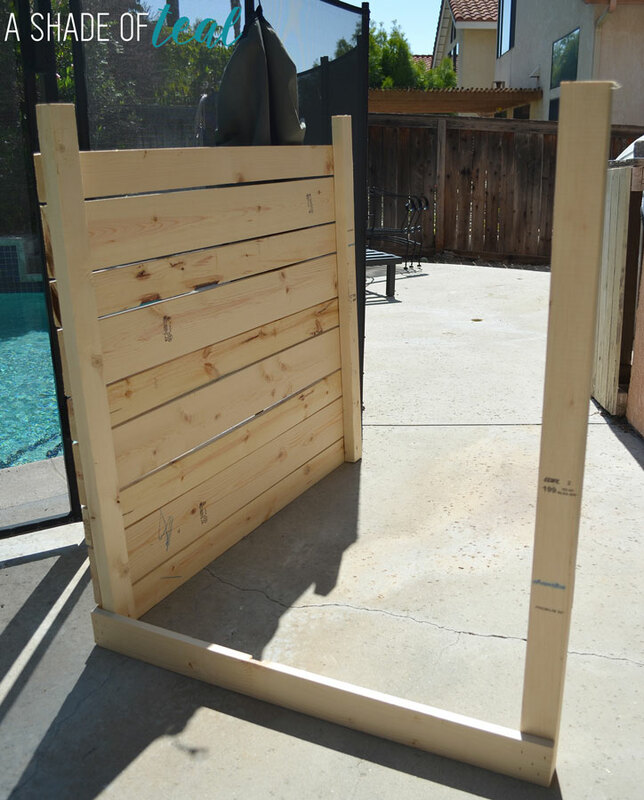 Once this piece is on you can take your last post and nail it to the other side of the slat. It should stand on its own once this piece is on. Now just start nailing the rest of the slats. 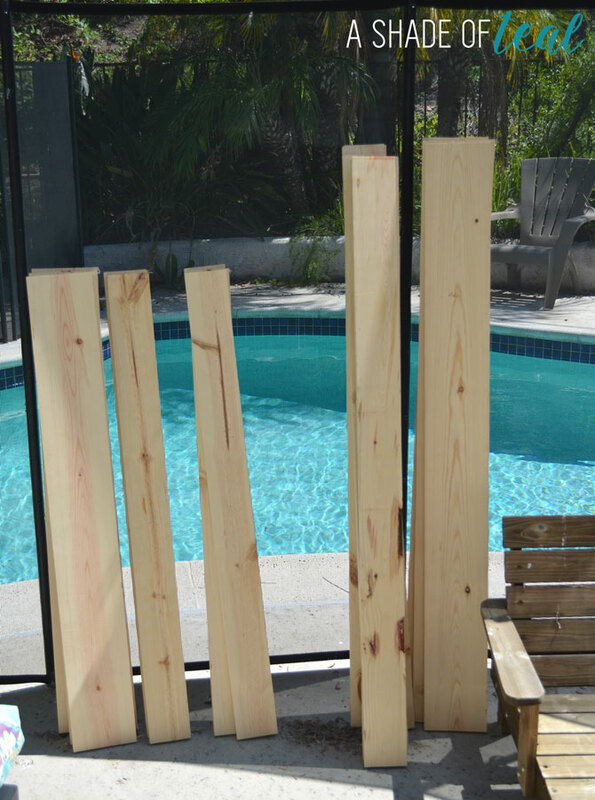 Its a little more trickier attaching the slats standing up rather than lying down; but I used wedge strips/scrap wood to space the boards. You’ll also want to follow the same pattern you did on the front. Here it is all done! Its upside down still, you might need help flipping it over along with moving it. Since my AC unit is right against the house I only need 2 walls. But you can repeat the same process if you need a 3rd wall. If you remember the before area. Now after I moved the cover in place. I still need to level the ground in this picture since this area is actually sloped down. It also looks like the unit is too short. 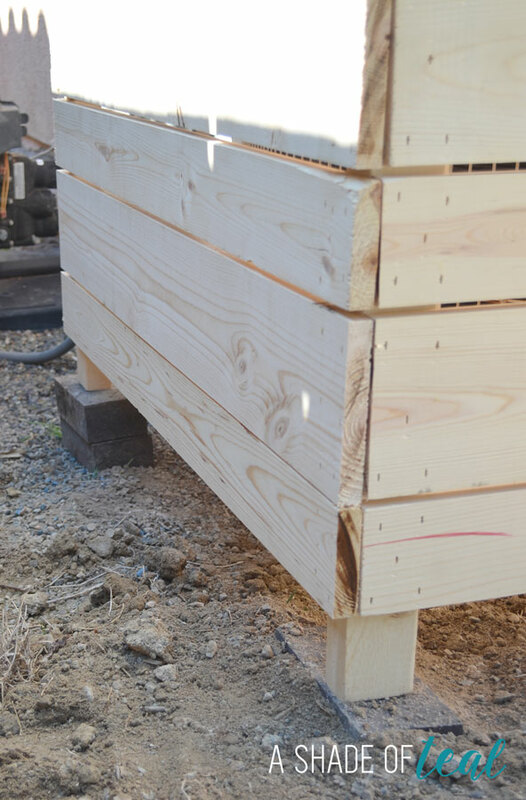 Well it kinda is, I wish I made it 5″ higher but my quick fix was to add blocks underneath the posts like so. The back needed 2 because of the slope. This looks ugly and unfinished now, but once the dirt and gravel go in you’ll never see the post. My last step for the day was laying down excess floor underlayment to act as a weed barrier. Next time I’ll reveal the entire side yard with new landscape and all. 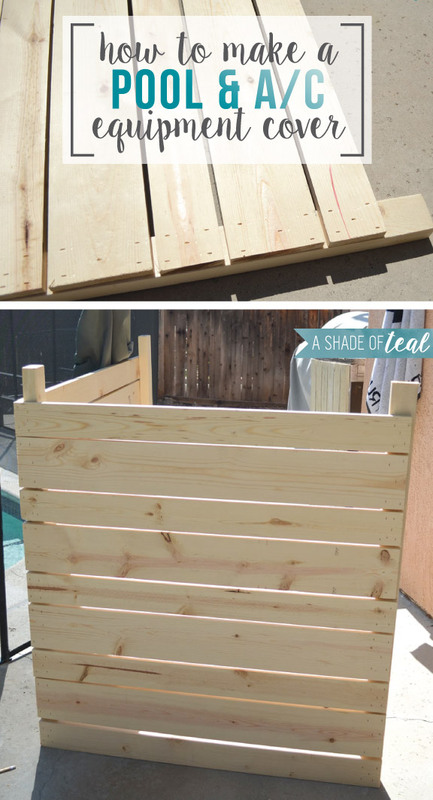 For more inspiration see my post on Clever Ways to Hide AC & Pool Equipment.